36th Gen. – ANARCHER Great Forester, of Flanders, died A. D. 837, leaving a son, About 800 A.D. the King of Denmark became oppressive, exacting high taxes from the nobles and their subjects. The Roman Empire about this time was crumbling and could not defend its provinces. The coast of Northern Europe including England and Scotland fell an easy prey to these Danish nobles. Much of Germany, France, Spain, Switzerland and Italy were conquered by these Norsemen. One of these Danish nobles, Anacher, organized the conquered territory into a state, and called it Flanders. ‘He was the ancestor of all the Fosters that ever lived.’ Says Pierce, the noted Chicago genealogist. Anacher procured large estates near Bruges, and also near Sluys, now in Holland. He made Arras, now in France, his capital of Flanders. Charlemagne, with the assistance of Anacher and his army, became the successful defender of Christianity and the Roman Empire from the attacks of the new swarms of Norsemen, elevated Anacher to a cabinet position which Charlemagne called the Great Forester; because Anacher was to have charge of all the wild animals and government lands of France. Anacher died in 837 and his son took his place. Charlemagne died in 814. 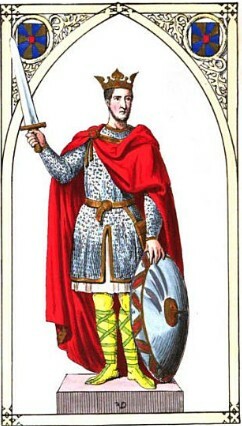 35th Gen. – BALDWIN I (wiki), (probably born 830’s, died 879), also known as Baldwin Iron Arm on account of his great strength, (the epithet is first recorded in the 12th century), was the First Count of Flanders. 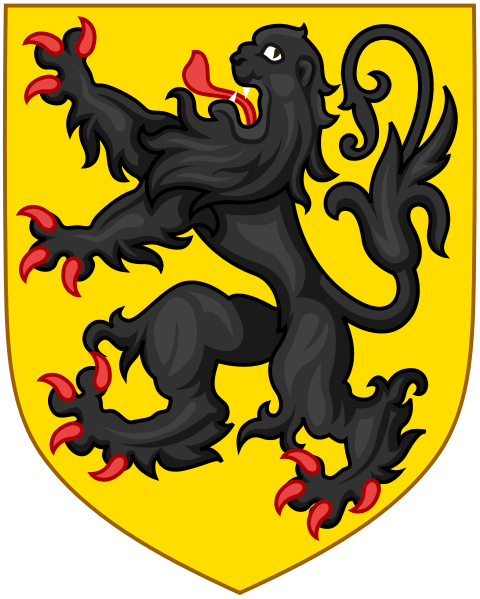 Coat of Arms of the Count of Flanders from the 9th century until the abolition of the position by the French revolutionaries in 1790. Judith first married in Oct 856 at Verberie sur Oise, France to Æthelwulf , King of England who abdicated on October 1, 856 and died in 858. Judith was only about 12 years old at the time, and the marriage was really nothing more than a demonstration of alliance between her father Charles “the Bald” and Æthelwulf. Judith then married to Æthelwulf’s son (from a previous marrage) and heir, Æthelbald,, King of England in 860. This marriage was considered to be “against God’s prohibition and Christian dignity” and they had an annulment the same year. Around Christmas 861, at the instigation of Baldwin and with her brother Louis’ consent Judith escaped the custody she had been put under in the city of Senlis, Oise near Paris after her return from England. She fled north with Count Baldwin. Charles had given no permission for a marriage and tried to capture Baldwin, sending letters to Rorik of Dorestad and Bishop Hungar, forbidding them to shelter the fugitive. After Baldwin and Judith had evaded his attempts to capture them, Charles had his bishops excommunicate the couple. Judith and Baldwin responded by traveling to Rome to plead their case with Pope Nicholas I. Their plea was successful and Charles was forced to accept. The marriage took place on 13 Dec 863 in Auxerre. Institution of Baldwin I ‘Bras de Fer’, the first count of Flanders by Charles the Bald, the Frankish king. By 870 Baldwin had acquired the lay-abbacy of St. Pieter in Ghent and is assumed to have also acquired the counties of Flanders and Waas, or parts thereof by this time. Baldwin developed himself as a very faithful and stout supporter of Charles and played an important role in the continuing wars against the Vikings. He is named in 877 as one of those willing to support the emperor’s son, Louis the Stammerer. During his life Baldwin expanded his territory into one of the major principalities of Western Francia, he died in 879 and was buried in the Abbey of St-Bertin, near Saint-Omer. 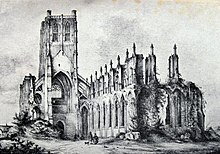 The ruins of Abbey of Saint Bertin in 1850. The abbey had its greatest flourishing from its inception in the 7th century until the 13th century, though it survived until it was shut down at the French Revolution. The early years of Baldwin’s rule were marked by a series of devastating Viking raids. Little north of the Somme was untouched. Baldwin recovered, building new fortresses and improving city walls, and taking over abandoned property, so that in the end he held far more territory, and held it more strongly, than had his father. He also took advantage of the conflicts between Charles the Simple and Odo, Count of Paris to take over the Ternois and the Boulonnias. In 884 Baldwin married ÆLFTHRYTH (wiki) (Ælfthryth, Elftrude, Elfrida), a daughter of King ALFRED the Great (wiki) of England. The marriage was motivated by the common Flemish-English opposition to the Vikings, and was the start of an alliance that was a mainstay of Flemish policy for centuries to come. In 900, he tried to curb the power of Archbishop Fulk of Rheims by assassinating him, but he was excommunicated by Pope Benedict IV. He died at Blandinberg (near Ghent) and was succeeded by his eldest son Arnulf I of Flanders. His younger son Adalulf was (the first) count of Boulogne. 33th Gen. – ARNULF I (wiki), of Flanders, the Forester, (c. 890 – March 28, 965), called the Great, was the third Count of Flanders, who ruled the County of Flanders, an area that is now northwestern Belgium and southwestern Holland. 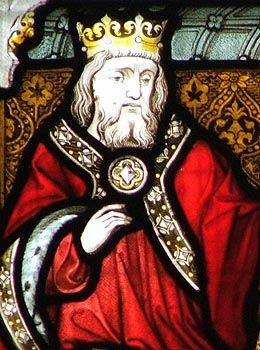 Arnulf was named after his distant ancestor, Saint Arnulf of Metz; this was intended to emphasize his family’s descent from the Carolingian dynasty. Arnulf I greatly expanded Flemish rule to the south, taking all or part of Artois, Ponthieu, Amiens, and Ostravent. He exploited the conflicts between Charles the Simple and Robert I of France, and later those between Louis IV and his barons. In his southern expansion Arnulf inevitably had conflict with the Normans, who were trying to secure their northern frontier. This led to the 943 murder of the Duke of Normandy William Longsword, at the hands of Arnulf’s men. The Viking threat was receding during the later years of Arnulf’s life, and he turned his attentions to the reform of the Flemish government. In 934 he married ADELE of Vermandois, daughter of HERBERT II of Vermandois. He also had a previous daughter, Hildegard. Arnulf made his eldest son and heir BALDWIN III of Flanders co-ruler in 958, but Baldwin died untimely in 962, so Arnulf was succeeded by Baldwin’s infant son, ARNULF II of Flanders. 32nd Gen. – BALDWIN III (wiki), (940 – 1 Jan 962) Count of Flanders, who briefly ruled the County of Flanders , together with his father Arnulf I. Arnulf I had made Baldwin co-ruler in 958, but Baldwin died before his father and was succeeded by his infant son Arnulf II, with his father acting as regent until his own death. On her husband’s death, Rozala acted as regent for her young son. In 988 or 989, despite being over fifty years old, she married Robert the Pious, the Rex Filius of France; he was not particularly enthusiastic about the marriage, which had been arranged by his father, King Hugh of France. She brought her husband Montreuil and Ponthieu as a dowry. Upon her marriage, she took the name of Susannah. When her father-in-law died, however, Robert repudiated her, desiring to marry Bertha of Burgundy in her place. Rozala then retired to Flanders, where she died and was buried. 30th Gen. – BALDWIN IV (wiki). (980 Ghent – 30 May 1035 Ghent) Count of Flanders from 988 until his death called “of the handsome beard,” Baldwin first married OGIVE of Luxembourg, daughter of FREDERICK of Luxembourg, by whom he had a son and heir Baldwin V. He later married Eleanor of Normandy, daughter of Richard II of Normandy, by whom he had at least one daughter Judith who married Tostig Godwinson and Welf I, Duke of Bavaria. A famous warrior who defended his country against the combined forces of Emperor Henry, King Robert of France and the Duke of Normandy. In contrast to his predecessors Baldwin turned his attention to the east and north, leaving the southern part of his territory in the hands of his vassals the counts of Guînes, Hesdin, and St. Pol. To the north of the county Baldwin was given Zeeland as a fief by the Holy Roman Emperor Henry II, while on the right bank of the Scheldt river he received Valenciennes (1013) and parts of the Cambresis and Hainaut. Valenciennes, France today – In 1008, a terrible famine brought the Plague. According to the local tradition, the Virgin Mary held a cordon around the city which, miraculously, has since protected its people from the disease. Since then, every year at that time, the Valenciennois walk around the 14 km road round the town, in what is called the tour of the Holy Cordon. In the French territories of the count of Flanders, the supremacy of the Baldwin remained unchallenged. They organized a great deal of colonization of marshland along the coastline of Flanders and enlarged the harbour and city of Brugge. 29th Gen. – BALDWIN V (wiki), (19 Aug 1012 – 1 Sep 1067) Count of Flanders from 1035 until his death. called “Le Debonaire,” In 1028 Baldwin married ADELE of France in Amiens, daughter of King ROBERT II of France; at her instigation he rebelled against his father but in 1030 peace was sworn and the old count continued to rule until his death. Adela Capet, Adèle of France or Adela of Flanders, known also as Adela the Holy or Adela of Messines; (1009 – 8 Jan 1079, Messines) was the second daughter of Robert II (the Pious), and CONSTANCE of Arles. She married first 1027 Richard III Duke of Normandy (997 † 1027). They never had children. As dowry to her future husband, she received from her father the title of Countess of Corbie. Adèle’s influence lay mainly in her family connections. On the death of her brother, Henry I of France, the guardianship of his seven-year-old son Philip I fell jointly on his widow, Ann of Kiev, and on his brother-in-law, Adela’s husband, so that from 1060 to 1067, they were Regents of France. When Adela’s third son, Robert the Frisian, was to invade Flanders in 1071 to become the new count (at that time the count was Adela’s grandson, Arnulf III), she asked Philip I to stop him. Philip sent troops in order to aid Arnulf, being among the forces sent by the king a contingent of ten Norman knights led by William FitzOsborn. Robert’s forces attacked Arnulf’s numerically superior army at Cassel before it could organize, and Arnulf himself was killed along with William FitzOsborn. 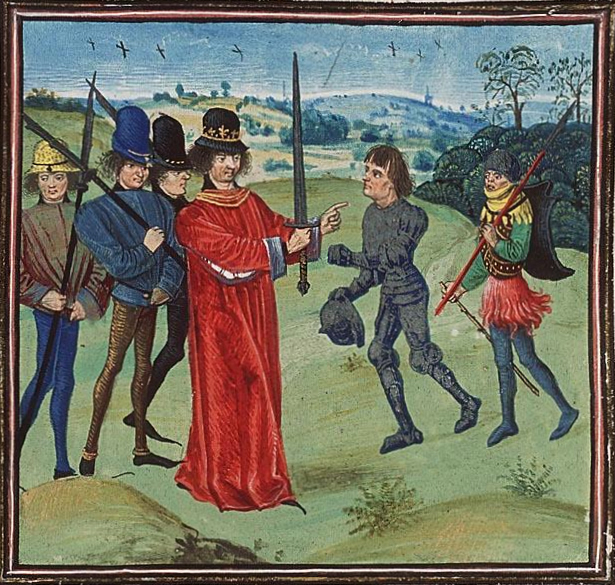 The overwhelming triumph of Robert made Philip invest him with Flanders, making the peace. A year later, Philip married Robert’s stepdaughter, Bertha of Holland, and in 1074, Philip restored the seigneurie of Corbie to the crown. Adèle had an especially great interest in Baldwin V’s church-reform politics and was behind her husband’s founding of several collegiate churches. Directly or indirectly, she was responsible for establishing the Colleges of Aire (1049), Lille (1050) and Harelbeke (1064) as well as the abbeys of Messines (1057) and Ename (1063). Robert I of Flanders, c.1033–1093 the Frisian, was count of Flanders from 1071 to 1092. Sir RICHARD of Flanders [ Click his link for the second half of this Royal post] (c. 1050 – ) Many sources don’t show a child Richard son of Baldwin V. While it is possible that a Richard Forster was knighted by William the Conqueror at age 16, he may not have been a son of Baldwin V, or a brother to Baldwin’s daughter Matilda who married William. Perhaps Richard did come to England as a yeoman soldier or possibly a squire to one of William’s knights and was knighted for bravery after the battle of Hastings. However, his origins are obscure. Richard might have been from one of the Germanic provinces with Forster (with an umlaut over the ‘o’) as his place of origin, probably a well-known forest. Not many had true surnames in this time period and were known by occupational or place names. He may even have been the son of a forester. During a long war (1046–1056) as an ally of Godfrey the Bearded, Duke of Lorraine, against the Holy Roman Emperor Henry III, he initially lost Valenciennes to Hermann of Hainaut. However, when the latter died in 1051 Baldwin married his son Baldwin VI to Herman’s widow Richildis and arranged that the sons of her first marriage were disinherited, thus de facto uniting the County of Hainaut with Flanders. Upon the death of Henry III this marriage was acknowledged by treaty by Agnes de Poitou, mother and regent of Henry IV. Baldwin V played host to a grateful dowager queen Emma of England, during her enforced exile, at Bruges. He supplied armed security guards, entertainment, comprising a band of minstrels. 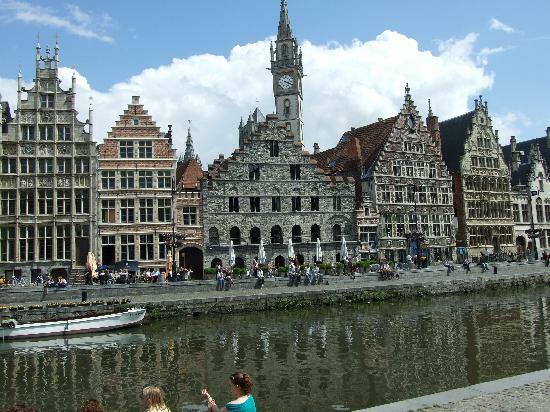 Bruges was a bustling commercial centre, and Emma fittingly grateful to the citizens. 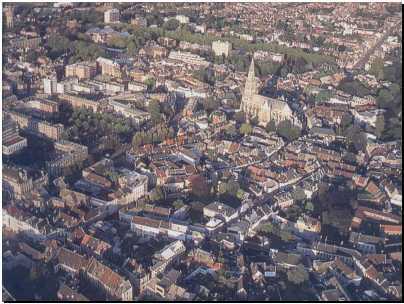 She dispensed generously to the poor, making contact with the monastery of Saint Bertin at St Omer, and received her son, King Harthacnut of England at Bruges in 1039. From 1060 to 1067 Baldwin was the co-Regent with Anne of Kiev for his nephew-by-marriage Philip I of France, indicating the importance he had acquired in international politics. As Count of Maine, Baldwin supported the King of France in most affairs. But he was also father-in-law to William of Normandy, who had married his daughter Matilda. Flanders played a pivotal role in Edward the Confessor‘s foreign policy. As the King of England was struggling to find an heir: historians have argued that he may have sent Harold Godwinsson to negotiate the return of Edward the Atheling from Hungary, and passed through Flanders, on his way to Germany. Baldwin’s half-sister had married scheming Earl Godwin‘s third son, Tostig. The half-Viking Godwinsons had spent their exile in Dublin, at a time William of Normandy was fiercely defending his duchy. It is unlikely however that Baldwin intervened to prevent the duke’s invasion plans of England, after the Count had lost the conquered province of Ponthieu. By 1066, Baldwin was an old man, and died the following year. This entry was posted in Artistic Representation, Historical Site, Line - Miller, Public Office, Royal Ancestors, Veteran, Wikipedia Famous and tagged Arnulf I, Arnulf II, Baldwin I, Baldwin II, Baldwin III, Baldwin IV, Baldwin V, Counts of Flanders. Bookmark the permalink. It was very common in that period to record the names of the heirs and other notable children, the names of many minor children from many noble families were rarely mentioned. But with Matilda marrying William, the prospect of improving his position suddenly became viable, he was very likely well trained in combat as a son of nobility and therefore explains his success on the battlefield at Hastings. A Yoeman would not have had the skills or the leadership during the battle to have to have been rewarded with Knighthood by William and given large territory’s in the north of England. William would have wanted someone related to him by blood or marriage. Sir Richard was undoubtably the son of Baldwin VI, youngest brother of Matilda (Williams wife) and brother in law to William The Conquerer. Is it possible that Sir Richard of Flanders is a son out of wedlock by Matilda and identified as Baldwin’s son in order to protect lineage? In honor of heritage and contemporary family members, I intend no disrespect. Can you elaborate as much as possible? I’ve traced my family tree to this individual.